Our partner, Aperture Education’s social and emotional assessment and intervention system featuring the nationally recognized Devereux Student Strengths Assessment (DESSA) and DESSA-mini. The DESSA System is a comprehensive, cloud-based system used to assess, inform and improve the social and emotional skills of children both in-school and out-of-school. It features the Devereux Student Strengths Assessment (DESSA), an empirical, standardized and strength-based assessment that provides reliable data on the strengths of students’ social and emotional skills, as well as areas where students may need additional instruction. With over twelve years of research behind it, the DESSA is one of the most reliable tools to assess social and emotional skills. Paired with the award-winning technology available within the DESSA System, it offers reliable and user-friendly data that schools and out-of-school-time programs can count on. The DESSA has been cited by a number of research and media organizations for its strong research-based foundation, emphasis on promoting the social and emotional strengths of children, and ability to be used in conjunction with many other effective SEL programs. 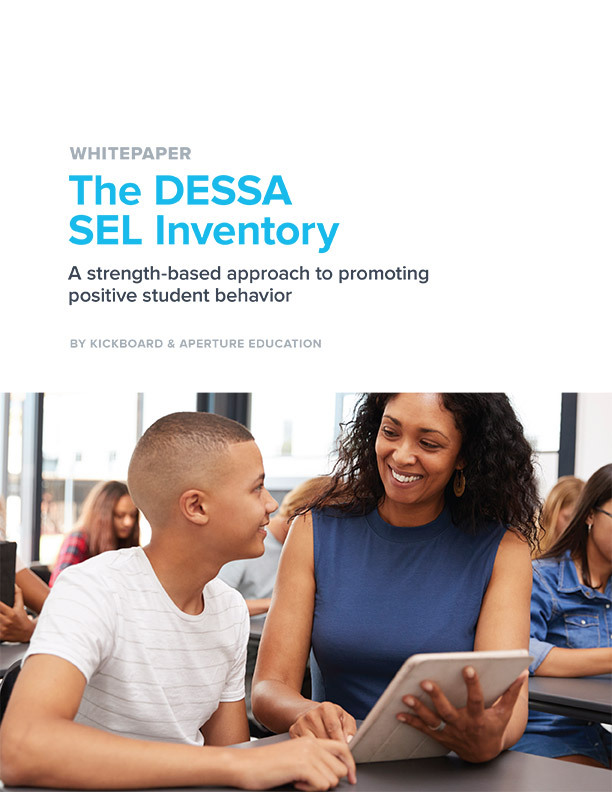 The DESSA SEL Inventory, available through Kickboard, is a set of student behaviors for real-time monitoring that is derived from the DESSA. The DESSA SEL Inventory offers Kickboard users a curated set of 40 behaviors related to eight social-emotional competencies. Along with the DESSA and DESSA-mini (a shorter, but still reliable 8-question screener), DESSA System users have access to research-informed Intervention Strategies and Foundational Practices, used to bolster social and emotional skills on eight SEL competencies. These strategies can be used universally (large group settings, like a classroom), in small groups, individually, or as take-home assignments. In addition, each competency comes with a teacher reflection activity – allowing users to understand their own social and emotional strengths and areas of need.